Google Pixel 3 XL vs. Samsung Galaxy S9+: Which should you buy? We use and test every single high-end Android phone to learn their strengths and flaws so we can help you make the right decision. Every phone has to balance various factors to create the best possible experience, and we find which ones are up to the task. Google refreshed its hardware and jumped to a 6.3-inch 18.5:9 display — but it's not all about size, the display is dramatically better as well. The rest of the phone builds on all of Google's strengths: simple hardware, capable specs, smooth software and an amazing camera experience front and back. It also added wireless charging and kept stereo speakers. The Galaxy S9+ is the flagship phone all Androids are inevitably compared to. It consistently outsells the competition for a reason: it has every feature and spec people want, with few caveats. Build quality, performance, specs and features are all here, plus a great camera and well-known brand to wrap it all together. Samsung undeniably has the benefit of mass appeal and mindshare among general consumers thanks to massive sales over the past five years, but Google's Pixels have a small, devoted following that finds the simpler approach appealing. Here are the differences between the two. What's the difference between the Google Pixel 3 XL and the Samsung Galaxy S9+? Whether you choose the Pixel 3 XL or Galaxy S9+, you're getting all of the core features, specs, and hardware design you expect from this level of phone. Google does things its own way in many respects, but it hasn't created hardware that's particularly unique. Both phones are large metal-framed, glass-backed slabs, with slightly different takes on the finer details — the Pixel 3 XL is flat and has glossy sides, compared to the GS9+ with its curved screen and matte metal finish. The Pixel has an etched glass back that cuts down on fingerprints as well, and has colors that are dull rather than shiny. You get IP68 water and dust resistance on both, thankfully. There isn't much differentiation in the hardware or design — just the details. The phones are the exact same height, and nearly identical in weight and thickness, with the only difference between them being the GS9+'s narrower body on account of its curved display. Usable screen real estate is near-identical, on account of the Pixel 3 XL's notch taking up a little room. You get the same sort of asymmetrical stereo speakers on both phones, too. Elsewhere inside the phones, they have the same processor, same base storage, and all of the typical connectivity options. The batteries are also nearly the same size, and they both have both fast wired and wireless charging — though the Pixel has a slight advantage in charge speed with a cable (we'll get a better feel for real-world battery life on the Pixel 3 XL soon). Samsung has the advantage of 6GB of RAM in the GS9+, whereas the Pixel 3 XL's 4GB feels a little small for 2018 — though Google has historically done well with performance with less RAM. The only real hardware wins for Samsung are with storage and audio. Though both phones have the same base 64GB storage, the Galaxy S9+ is available with up to 256GB internally and has a microSD card slot for the big storage users out there. It also has a standard 3.5mm headphone jack, which is a really big draw for many buyers. The Pixel 3 XL comes with a USB-C to headphone adapter and USB-C headphones, but it's far more cumbersome than using the headphones you already have without any adapter. Google already arguably had a better camera than the GS9+ when it came to shot-to-shot quality in the Pixel 2, and now a year later it's rolling out faster processing, better image quality, and new features that help it compete with Samsung's dual-lens solution. The Pixel 3 XL has new digital zooming tech, which removes the need for a secondary telephoto lens, a new "Night Sight" mode that promises better low-light shots than simply having an f/1.5 lens, and faster processing with the Pixel Visual Core to remove some of the sluggish performance of last year. Samsung's pair of cameras is really good, but Google likely just took a good leap ahead of Samsung if these features work out even somewhat as intended. With some fresh features and a second selfie shooter, Google likely just jumped ahead of Samsung's cameras. Up front, Google now matches Samsung with autofocus on its front-facing camera, which is a real improvement for selfies that you won't want to give up once you've experienced it. But again it's stepping ahead of Samsung with a second camera for wide-angle shots and even better portrait mode photos. Perhaps the biggest deciding factor in which phone is best for you is how you feel about Google's approach to software. The Pixel 3 XL doesn't change Google's formula: a simple, sleek, consistent and powerful software experience with deep integration of Google's apps and services, and little extra cruft or bloatware. Android 9 Pie is a great version of the OS, with tons of user-focused features and an emphasis on battery life and taming notifications. Google's software is far simpler and less involved than Samsung's and requires less work to get set up and operating how you want. The other side of that coin is dramatically fewer customization options, and few whizz-bang features built in — you'll have to download apps for more advanced functions. How much you value Google's clean and simple software may be the deciding factor here. In losing all of the extra features and customization options, you get the benefit of having the latest and greatest Android software before anyone else. You'll get security updates every single month, and you'll get the latest feature updates as soon as they're available. The security aspect is absolutely important, and some people will also value having the top features right away. Because the Galaxy S9+ is now several months old, it starts to carve out a price advantage over the new Pixel 3 XL. Though the retail price for the GS9+ was high, it's now regularly available unlocked for about $700. At that price, it's a considerable jump up to the Pixel 3 XL's price of $900. If the price is at all a factor for you, the GS9+ may just edge ahead of the Pixel 3 XL, either because of its notably cheaper unlocked price or because of its wide carrier availability that increases the chance you can find it further discounted or available as part of other promotions from the carriers. However, if you value software simplicity and camera performance, start looking at the Pixel 3 XL — it'll be worth your consideration. 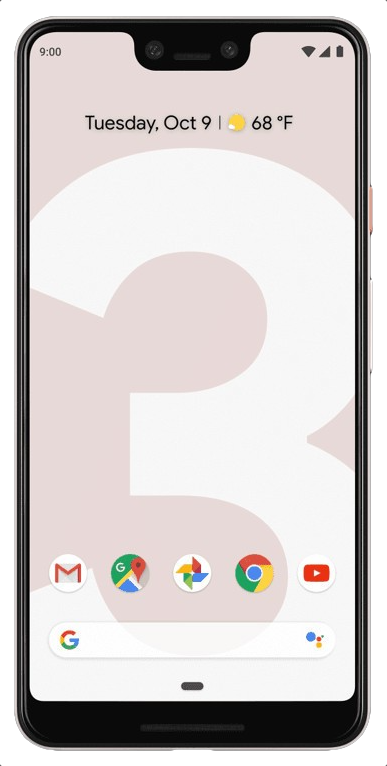 Phones are large nowadays, and Google's Pixel 3 XL is no exception. A 6.3-inch OLED screen is dramatically improved from the Pixel 2 XL, and the rest of the experience builds on Google's strengths: awesome software, great performance, innovative camera features. and guaranteed updates. It's hard to argue with Samsung's formula. The hardware is beautiful, well-built, and filled with top-end specs and features. The GS9+ has an industry-leading display, fantastic camera and every feature a phone buyer wants. The software just requires some massaging to work the way you need it to.